Last month at Blog On MSI in Manchester, I met the team at Real Handful. 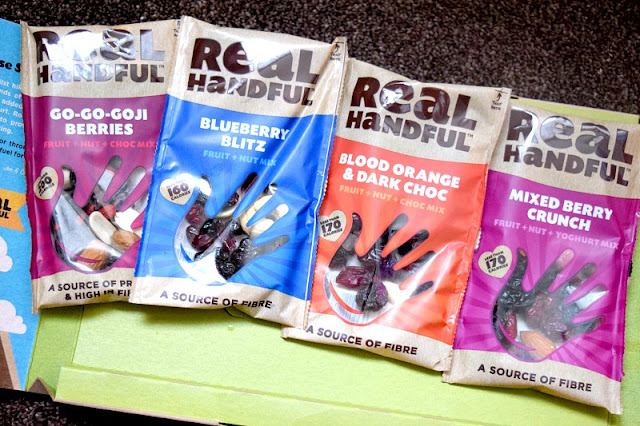 Real Handful make tasty and nutritious blends of the best quality dried fruits, whole nuts and seeds with added yummy ingredients like natural flavours, chocolate and yoghurt. Their aim is to prove that healthier impulse snacks can still taste amazing. After returning home, I received an email asking if I would like to try some of the range and I couldn't say no after trying the delicious Banoffee flavour, which has sadly been discontinued now, in my goody bag. I was sent four different mixes to try; Blueberry Blitz, Blood Orange & Dark Chocolate, Go-Go-Goji Berries and Mixed Berry Crunch. Out of the four, the only one I didn't love was Go-Go-Goji Berries. I am not sure why as I usually love Goji berries but I just really wasn't keen. However, the kids ate the rest of that packet for me without hesitation! I can't even decide on a favourite out of the other three. The blueberries were seriously yummy, the chocolate was a great addition to the blood orange and dark chocolate pack and the flavours went so well together. The mixed berry crunch pack had some lovely yoghurt bites mixed in which tasted lovely with the flavours of the mixed berries. 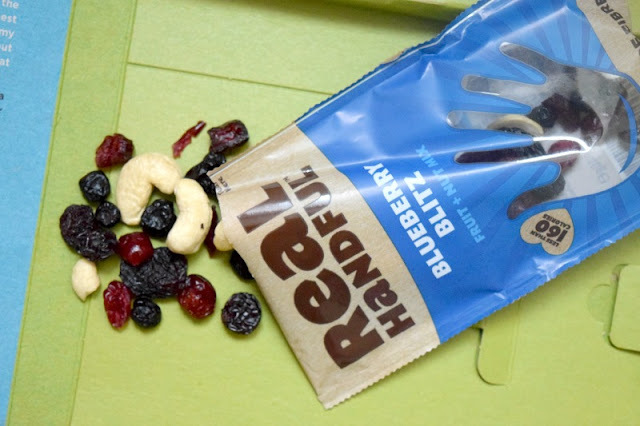 I really enjoyed the Real Handful snacks and will definitely buy some more while I am on the go. In fact I would probably prefer them to a chocolate bar. They are great for travelling or keeping in your handbag. They are available now from Ocado or Holland & Barrett. As well as sending me a few packets to review, Real Handful have offered some to giveaway to one of our lucky readers. To enter simply follow the instructions on the Rafflecopter form below. Open to UK only. The competition will end 10/07/2016 at midnight. All entrants must complete the mandatory entry on the rafflecopter form. Those who don't will have all entries removed. All winning entries will be verified to ensure the entry has been completed correctly. The blog owner will choose the winner through the rafflecopter form (which uses random.org) The winner will be notified by email and displayed on the widget. two winners will receive one Real Handful ration box each containing 4 packets of Real Handful snacks. No alternative prize will be offered. Allow up to 28 days for delivery.